Dirt Rally 2.0 is like a well-groomed cat. It makes you work for its affection; nonchalant to your efforts to befriend it until eventually after many hours, it decides to allow you a tummy rub. And by tummy rub I mean the ability to get to the end of rally stage without having mashed the front end of your car into a tree. Yes it’s a difficult feline and that was a bad analogy. After many years of quality releases, Codemasters have an unquestionable ability to produce solid, playable racing games loaded with depth, but occasionally lacking in character. 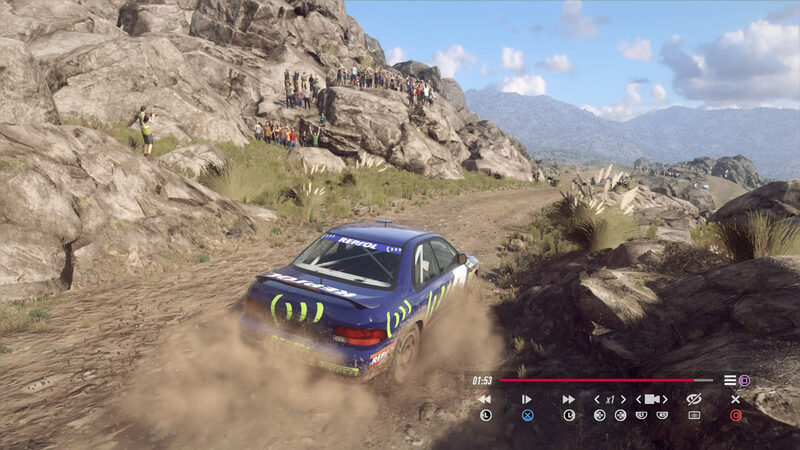 Dirt Rally 2.0 continues this trend, although after the slightly unnecessary presentational pizazz of Dirt 4 and the Grid series, this aloof attitude is now morphing into something more refreshingly straightforward. 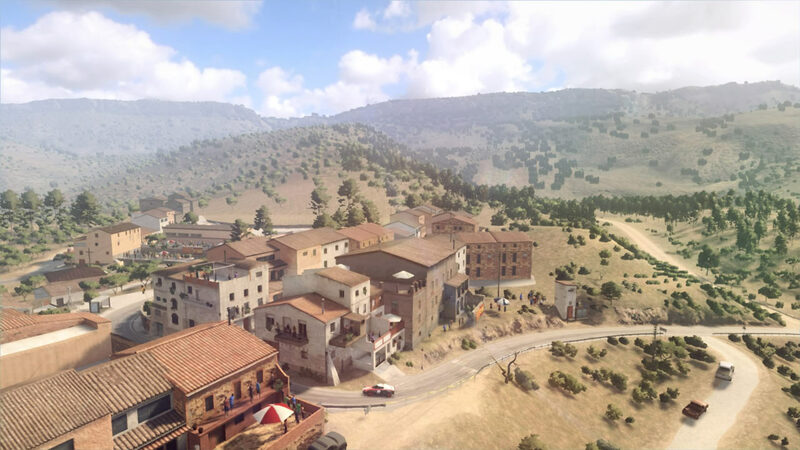 Building on the simulation groundwork of the previous Dirt Rally game, version two is a complete rebuild with a less Euro-centric stage selection, improved graphics and a slightly more accessible gameplay model. 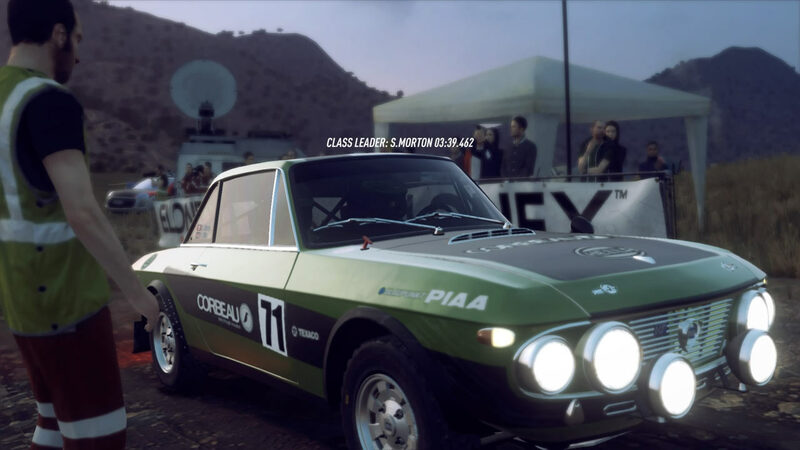 The usual racing game options are present and correct with the ‘My Career’ option offering up six international rallies, starting with a range of classic 60s rally cars to ease you in. The FIA licensed Rallycross championship is the alternative – 5 cars doing multiple (read endless) heats of 4 laps until the final race of 6 cars. Daily / weekly / monthly online challenges of both of the above are also up for grabs where you can post your stage times against other Dirt Rally 2.0 players across the globe and also different platforms. If you’d like the more casual experience of ‘Freeplay’, there are the shorter, snappier options of Historic Championship, Time Trial and Online racing. The career mode takes you through six different countries – Poland, Argentina, USA, Spain, New Zealand and Australia and these include a variety of most rally road surfaces except ice and snow which is to feature in upcoming European DLC tracks. Initially the cars handle like oiled walruses on a frozen lake, and for an inexperienced Dirt Rally driver, it can appear to be impenetrably difficult and not particularly enjoyable. After many frustrating stages, perseverance eventually pays off when your instincts kick in and the incidents of car flipping, tree collisions and punctures on rocks start to diminish. Once you’re in the zone, the point to point rallying becomes much more enjoyable and less like a form of torture. Naturally, you are punished severely for any mistakes with severe time penalties for off-roading into a forest or flipping onto your roof. You’d better avoid smashing your headlights on the night stages otherwise you are forced to drive in the dark which is practically impossible. Fortunately you have five restarts across each of the six competitions which make up the championship, and the credits you earn during the events can be used to train up your staff to minimise the penalties during the races. As well as the staff, your car can also be upgraded with various different improvements available to the engine depending on your mileage, and suspension and brakes upgrades which can be purchased with earned credits. During the point to point rally events, the lighting adds a major hindrance to navigating the twisting courses – one minute you are blinded by the sun and the next the visibility is reduced to near darkness in heavily wooded areas. Though adhering to the realistic variables of natural lighting, too much emphasis has been added to the dynamics of light during the events and seems akin to how a lens reacts rather than the human eye. The end result is visually agreeable, but being forced to frequently squint to make out the advancing road seemed a bit like over-egging the (dynamic lighting) pudding. Each of 50+ cars included in the base game (pre-DLC) has noticeably different driving characteristics, and you’ll settle on your favourites soon enough. As the engine sizes increase, more frugal use of the controls is essential if you want to stay on the road. The six driving views are all very useable, so whatever your angle preference, you’ll find a setup which suits you. 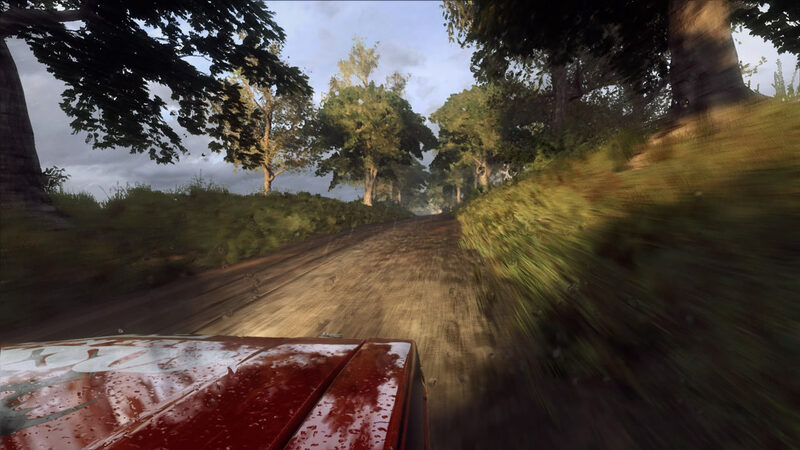 While it’s nice to see your car traverse the tracks from the third person views, the bonnet or cockpit options perfectly fit the realistic simulation model of the game. The sense of speed is incredible, a veritable white-knuckle mudslide with an amazing sense of momentum. This is particularly apparent when you realise you have a tight corner approaching after you’ve picked up speed on straighter sections and you scramble to reduce speed for the next turn. The authentic rally courses across the six countries each have their own character – New England has some stunning autumnal forest sections, Poland has water and mud in spades and Spain will attempt to crunch your suspension on rocks or fling you from a cliff in equal measures. A little more graphical variety on each of the longer point to point events would have been welcome, as it sometimes felt like some of the roadside details had been copied and pasted from other sections. Authentic yes, but also occasionally dull. 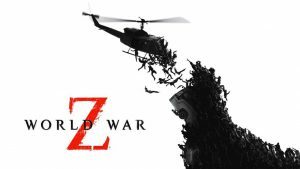 As you’d expect from a AAA title, the game is graphically stunning, with the extraordinary level of detail becoming apparent on the replays. All of the car models are impressive inside and out and refreshingly lack the exaggerated sheen of most racing games. The TV camera shows off the brilliance of the scenery, and the sheer sense of speed is enhanced by the fantastic engine sound. Your co-driver has his work cut out and the tremble in his vocal cords at high speed is a nice touch. A few expletives after a crash would have been welcome, but hey – these guys are professionals. 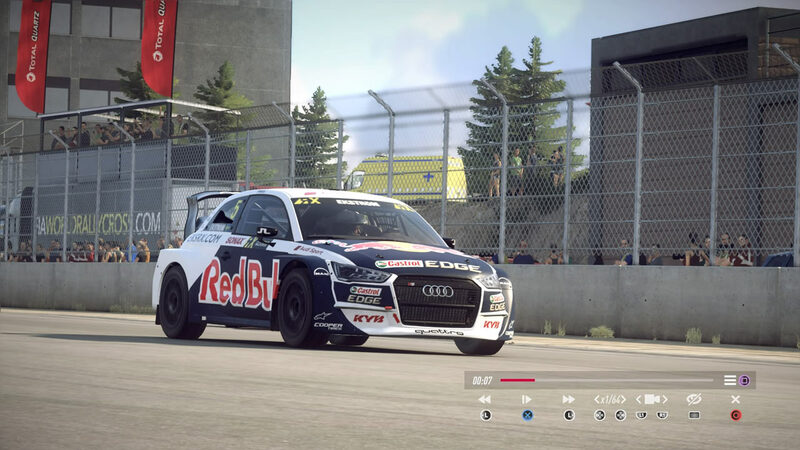 The officially licensed FIA Rallycross Championship makes up the other half of the Dirt Rally 2.0 package, and despite the promise of roughhousing with a bunch of other cars on a small circuit, it’s a pretty lacklustre experience. The licensed format dictates multiple qualifying races of four laps each, leading towards a final race with the six fastest cars. The problem is the tracks aren’t very inspiring and the AI drivers don’t offer a great deal of a challenge. The whole raft of repetitive races which make up the championship soon became a chore and I couldn’t wait to get back to the classic point to point races and leave Rallycross behind. 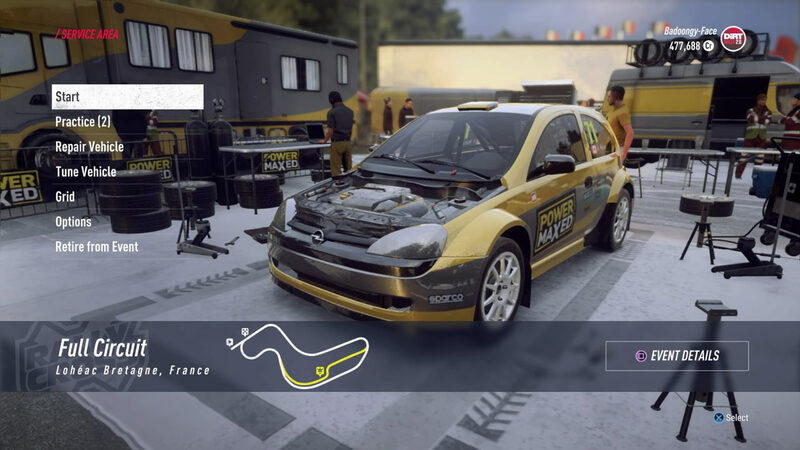 Taking a leaf from Dirt Showdown’s book wasn’t really an option I guess, but perhaps Codemasters can ditch the FIA licence next time and inject some merriment instead. 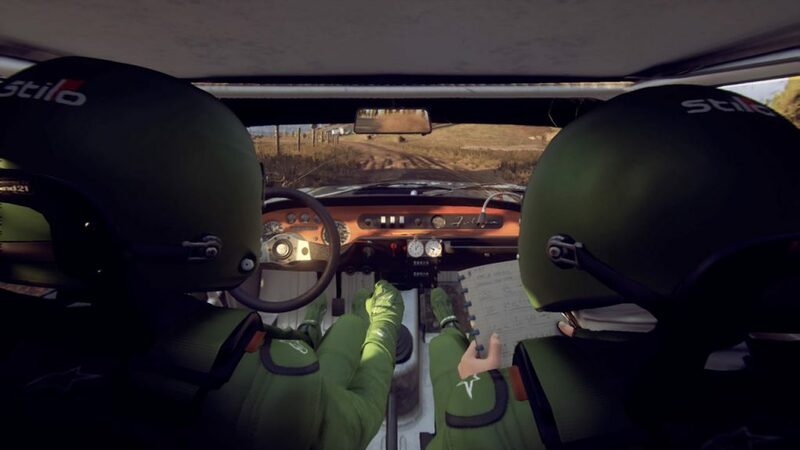 Dirt Rally 2.0 wouldn’t buy you a pint down the pub or know any good jokes, but it would be great at helping you with some DIY or organising a funeral. The refreshingly straight-faced front-end, unremittingly solid driving experience and great presentation combine to deliver one of the best rally simulations available. For more casual racers, the demanding learning curve may err too far away from enjoyment into hair-tearing, but if you put in the time, it will pay dividends as a breakneck against the clock experience. There’s nothing new or ground breaking here, just perfect refinement of several generations of rally series’ from the most seasoned racing developer around. 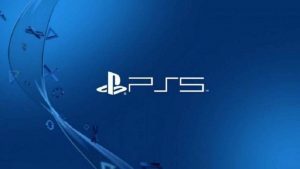 Dirt Rally 2.0 was developed by Codemasters and published by Codemasters/Deep Silver and is available from Feb 26th 2019 on disc or via the PS Store.